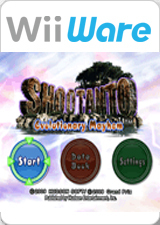 In Shootanto: Evolutionary Mayhem, fight for your right to evolve! You are about to enter the battle for the future in a world governed by the law of the jungle. As you move through the stages your character evolves, and your weapons and shooting abilities change. First you start by throwing weapons by hand, then proceed to using tools where you can have a taste of many different types of projectiles. Cooperative 2 player mode is also available. The controls are simple! Move the character with the Control Stick and the crosshairs with the Wii Remote, and shoot down the targets while dodging enemy attacks. Getting hit by an enemy bullet or touching an enemy close to you will count as a miss. With each miss, you will lose one heart from the bottom indicator of the screen, and losing all hearts will end the game. The graph below charts the compatibility with Shootanto: Evolutionary Mayhem since Dolphin's 2.0 release, listing revisions only where a compatibility change occurred. This page was last edited on 23 January 2018, at 05:21.